The 2.7mm multi procedure rigid (m.p.r.) rigid set includes telescope, examination sheath, operative sheath with a channel, biopsy forceps, a retriever and light guide cable. You can earn 4885 Rewards Points on this product! 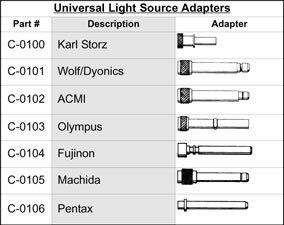 * This can be substituted for another light source connection to suit your equipment. 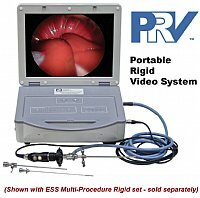 Add the ESS PRV(tm) Portable Rigid Video system to your purchase to make your Multi-Procedure rigid set into a video endoscopy system! Portable unit has built-in color LCD monitor, bright LED light source and a video camera head with controls and endocoupler to connect to the rigid eyecup of your endoscope. The PRV(tm) also has image and video capture capabilities that you can save to a standard SD Card (not included).